Hey friends, do you all shop online a lot? I was very reluctant about online shopping so far. I thought it's not my cup of tea. Another reason is that, I love to see the thing first before buying, if it really appeals my eyes, then I buy it. But I absolutely changed my thought when I get to know about this. Online shoppers, have you heard about the new buzz in town? Cuponation, a website which offers variety home, kitchen, restaurant and travel related discount coupons, deals and offers from all leading online retailers in India like Flipkart, Snapdeal, Jabong, Future Bazaar, Yebhi, Zovi, Homeshop18, E xpedia.co.in and many many more, I think you even havn't heard of some yet. You can do online shopping thru Cuponation and save a lots of money. I want to salute Cuponation for their great effort and I love this nice and new concept of online shopping which not only saves our time, saves a lot of our money, too. I suggest, You better visit their site to believe it. This year Cuponation is celebrating Women’s day which is on March 8th with this campaign, “Celebrate womanhood by taking care of yourself.” For this special day they have created special offers. 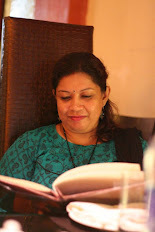 So visit their page to find all those special offers and celebrate womanhood. Recently I bought some Kitchen appliances & Bakeware at discounted rates using their coupons. Just go through their website & sign up for exciting deals !! I Bought these two sets of Silicone cupcake moulds from Flipkart and already baked some vanilla scones in there, will post that soon. 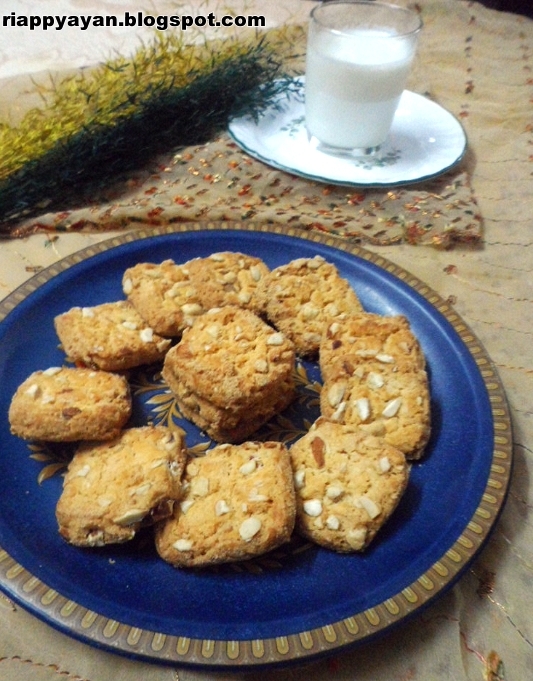 Now today's recipe : Oats Almonds Cookies..I added more oats flour than All purpose flour in this cookies to make it more healthy for my kids and it tasted real yummy and was very crispy too. Baking Powder : 1/2 tsp. Preheat oven to 175 degree C/350 degree F and line a baking tray with parchment paper. If you don't have parchment paper, grease your baking tray with butter and sprinkle little flour allover the tray. Keep aside. In a mixing bowl, add butter and sugar. Beat until creamy and smooth, for about 2-3 minutes. Then add egg and vanilla and beat again to mix. In another bowl, whisk together flour, oat flour, baking soda and baking powder. Now add flour mixture to the creamy batter little at a time and beat until incorporated. While incorporating, add few tablespoons of milk to make a semi-soft cookie dough. Note : Cookie batter should be little stiff, not so creamy like cake batter. Lastly, add 2/3 cup of slivered almonds and 1/2 cup whole oats to the batter and mix well. Now on the baking tray, drop little batter(about 1 tblsp. ), keeping about 1-2 inches space in between. Now with a wet finger, give your cookies a shape, round or square. 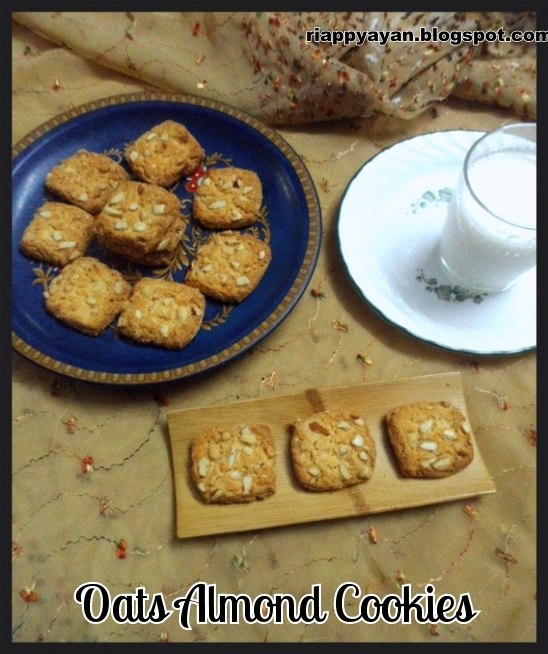 Sprinkle slivered almonds generously on each cookie. Put the prepared baking tray in the oven and bake for about 15-20 minutes or until the edges turn brown and center is still little soft. Don't keep cookies longer in the oven. Put off the oven and keep the cookies for another 10 minutes on the tray. Then take out and cool on wire rack. 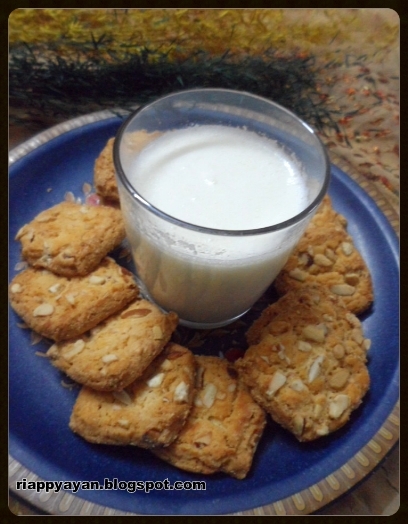 I have oats cookies too but different. Do check it out. yay for online shopping...these cookies look perfect Indrani. Now, I have new healthy recipe to try! Hope my family will like this. Yummy treats! thank you for sharing this delightful recipe to us! a must try! First of all i need to thank you for sharing a new cookies recipe. I wanna to order cookies online as soon as possible. I really like this blog about online deal of cookies. I also like the recipe of this deal. I will share this recipe with my friends.